If you follow the fashion scene, you would have seen that slouchy boots are exploding in popularity. At first, I wasn't too sure whether I liked them but the increasing amounts of outfits popping up on my Instagram feed have made them grow on me. I am not yet ready to try them, as I think they aren't as versatile as OTK boots, so I am sticking with what I know best! OTK are fun and go with a variety of different outfits and styles. Pair them with a flippy midi dress or skirt, or a mini A-line skirt. You should avoid super tight skirt styles, nobody wants Pretty Woman vibes. OTK also look incredible with skinny jeans and all sorts of cable knit sweaters, and I can't think of a more comfy, stylish and right on trend outfit combination for the season. Did someone say footwear of the decade? Thanks for reading beauties and I will see you soon with more from me, as I want to start bringing some beauty content back as well as a few festive season posts; I am SO ready for Christmas, are you? I know right! Tempted to get the grey pair as I LOVE them! Oh my gosh - you look absolutely amazing my love! love your boots! Im so dying to own one of those but I dont know where to use it since there's no winter in my country. Anyways, your gorgeous as ever! No way! These boots are from Ebay?? I didn't get any last year but would like some black ones this year. I just want to know if they stay up around your leg and don't slouch down. Loving the whole neutral vibe though. It suits you. They do stay up. the key is to get them with the tie bits! Such a cool boots! You look so stylish! I am obsessed with OTK boots and am dying to add a couple more pairs into my collection! Glad to see you as usual so beautiful, Pam! It's also good to know that over the knees boots are still on trend and I hope they never go out of trend. I loved your outfit with the boots! 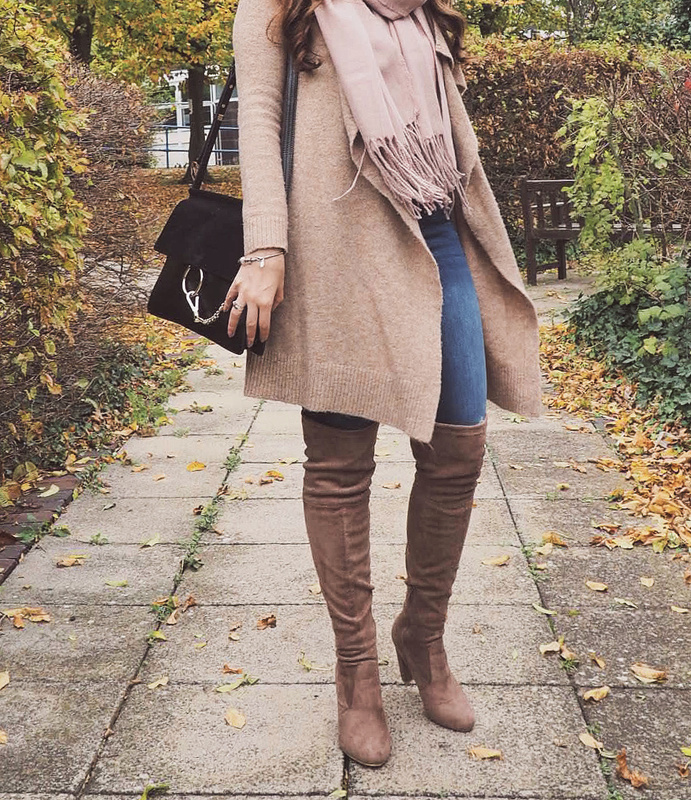 A cosy, beautiful outfit for autumn! Hope you have a lovely week! You are sooo gorgeous in neutrals! I love those OTK boots and I swear I wear mine literally all the time! They look so good on your legs! Can't blame you for your love of your boots, I love it too! They're warm, yet stylish, perfect for fall. Also, lovely cardigan and scatf combo you got there dear, and your hair is just gorgeous! I love the color combination of this outfit.everything falls perfect. O look é bem elegante, gosto desses modelos de botas! Love your photography style and aesthetic! I have around 15 pairs of over the knee boots and I still cannot stop buying them. Love your outfit and pics! You look too good and the boots are amazing. I would love to have a pair.